Even with one rail down, William Fox-Pitt of Great Britain is officially on a roll, winning the 2012 Rolex Kentucky Three-Day Event CCI****. After taking the top prize at Rolex for the first time in 2010 (aboard Cool Mountain), he won team gold and individual silver medals at the 2010 Alltech FEI World Equestrian Games. In 2011, he won the Land Rover Burghley Horse Trials CCI****, setting him up for a run at the Rolex Grand Slam of Eventing. The Grand Slam comes with a prize of $350,000 for any rider who consecutively wins Rolex, Badminton and Burghley in any order (a specific three of the six CCI**** events in the world). By winning Rolex, Fox-Pitt is now two legs down, one to go to become the only rider other than Pippa Funnell (in 2003) to win the Grand Slam. “It’s a fantastic position to be in,” said Fox-Pitt. “This is the closest I’ve gotten to the Grand Slam–I’ve never won two four-stars in a row before. It’s fairly unlikely [I’ll win the Grand Slam], but we’ll see.” He has two horses entered at Badminton, which takes place next week. Watch William Fox-Pitt and Parklane Hawk navigate the Head of the Lake on the Rolex cross-country course. Second-placed rider Allison Springer had a rail down with Arthur, giving Fox-Pitt the one-rail cushion he ended up using. 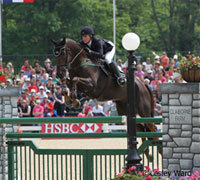 She remained in second place, but as the highest-placed North American rider, won an 18-month lease on a Range Rover. Arthur also received the “best conditioned” award, which is highly coveted among riders. The pair has come a long way in their show jumping to have just one rail down. “Four years ago (in 2008) I went in show jumping with five rails in hand, and at some point stopped counting because we had so many down,” said Springer. “[This year] I was excited to come in the show jumping ring, and was confident in my ride–my best was going to have to be good enough. It’s hard in those clutch moments, but we’re finally coming together.” A second-place finish at Rolex will also go a long way toward a possible U.S. team spot at the 2012 Olympics. New Zealand’s Jonathan Paget had two rails down to drop from third to sixth place. Although this was the third year in a row for the British to win (the last U.S. winner being Phillip Dutton in 2008), Americans held strong in the rest of the top five, with Boyd Martin on Otis Barbotiere in third, Karen O’Connor and Mr. Medicott in fourth, and Will Coleman on Twizzel in fifth. 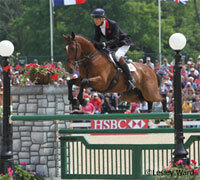 Piloting Otis Barbotiere in the 10-year-old Selle Francais gelding’s first four-star, Martin said, “I was thrilled. 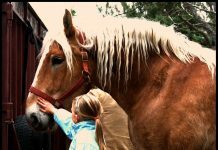 We picked up Otis in France at the end of 2010; I rallied a syndicate to buy the horse, but it was a huge gamble. I’m so happy he has confirmed what I thought of him–he’s as good as anything I’ve had, very strong in all three phases.” With four horses in contention for the Olympics (the others are Neville Bardos, Ying Yang Yo and eighth-place Rolex finisher Remington XXV), Martin has an enviably stacked deck of horses for selectors to choose from when assembling the U.S. team for London. It was an incredibly difficult renewal of the event, with only 27 of the 57 riders to start in the dressage phase making it to show jumping. 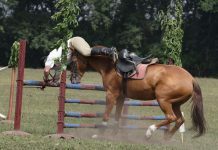 Among those that show jumped, a mere five were able to make it through the challenging, technical course without rails down. Congratulations to all the riders and horses who participated! YES!!!! My fav did it again!! And sooo happy to see he won with a ex-racer! so cool! Hope William wins the Grand Slam! !